In my mind, makeup artistry has been this unknown mystical set of skills that is set aside only for the highly trained professionals. The MUAs of the world. And along with these mind blowing skills comes a set of tools, products and high quality photos that have in the past made the act of applying (and wearing) makeup overwhelmingly terrifying. Imagine this scenario: You walk into a Sephora or fancy salon, whatever you choose, without a stitch of makeup applied. Not even brows. Now attempt to have any sort of confidence in makeup application. Got it? Ok, now tell the flawlessly HAC’d sales associate, who in reality is not judging you at all, that you are a beauty blogger. I like to call that asking for it. And though she is treating you like the non-mutant that you are, you begin to overcompensate and explain every last reason as to why you look the way you (think you) do. I bring this up because I recently went to Sephora in my gym clothes and yesterday’s smudged eye liner and did exactly this to the letter. And then, as I hid in the generic brush section, I realized something. It doesn’t actually matter! AT ALL!! Makeup is makeup. It is not who you are. It does not measure your worth or value. Uneven brows or poorly blended bronzer does not make me (or you) any less of a human being. This is why I decided to rock some seriously pretty purple eye shadow, bare my less-than-perfect photography skills, and not give a single ____ about it. Oh, and I’m in love with purple now and will be wearing it until I find some other obscure makeup item to latch on to. Create a clean canvas: NYX wonderstick is an amazing way to give your shadow staying power as well as make the color more intense and true to what you see in the tin. Rub some on your finger and press it into your eye lid. You could also use your favorite skin toned eyelid primer. 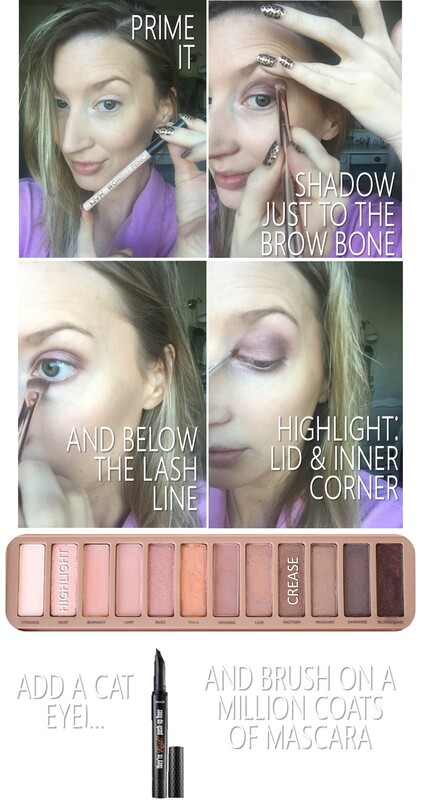 Build your Base: Using a shadow brush and “Factory” from the Naked 3 palette, apply in the crease of the eye and onto the brow bone. *I place a finger on my brow bone and “guard” my brush from going too far up. This is because I’m not to be trusted without a guideline. Also, take a swipe of color at your bottom lash line, too. It makes your eyes look huge. Blend it out: Yeah, just blend it. A lot. A fluffy eye shadow brush is best so if you don’t have one, go spend $3 at target and get one. Apply more shadow if you’d like, then blend again until you have zero harsh lines. The intensity is in your hands! Highlight: Using an angled brush, apply “Dusty” to the inner corner of the eye, on the lid at the lash line, and to the brow bone. Go high on the lid of you have a lot of real estate to cover. If not, focus in on the inner corners and lash line. Liner, Mascara, etc. : Finish it out with a cat eye or skip it. Either way is gorgeous. Throw on a ton of mascara, do some brow work, maybe even a coat of shimmering lip gloss…. You can’t get easier than just TWO colors. I mean, MUA or not, this is doable. Not even doable…master-able. Now go take a perfectly purple selfie because you’re a total babe and you deserve it. Love the story at the beginning – so true! I love naked 3 and purple looks awesome on you!!! Totally not the only one! Hahaha!!!! I want the Moondust shadow from Urban Decay in Intergalactic! It’s such a cool purple shade and screams October to me. Ether looks pretty cool too! How is it already mid September?! I can’t! So much purple! Love it. I’m a huge fan of purple, looks really good!